In Parts I and II of our series about fundraising registration, we took a look at an overview of the topic in general, then asked, Is All Fundraising Considered Charitable Solicitation? In today’s discussion, we are going to talk about the question on many people’s minds: What about a “donate” button on our website? Prior to the widespread availability of broadband internet, you rarely saw website (e-commerce) donation capabilities. That’s all changed now. With the advent of template-based website hosting like WordPress, Squarespace, Wix, or GoDaddy’s website builder, even the smallest nonprofit can have a professional looking web presence. Many of these website hosts include basic e-commerce tools at little or no cost. Throw in a credit card merchant account or Paypal, and you have everything you need for people to donate through your website. 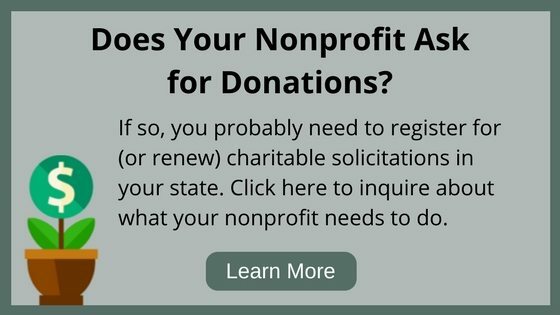 But, is that considered soliciting…at least for the purpose of having to register your nonprofit in all states that require it? Probably not, but the devil is indeed in the details. 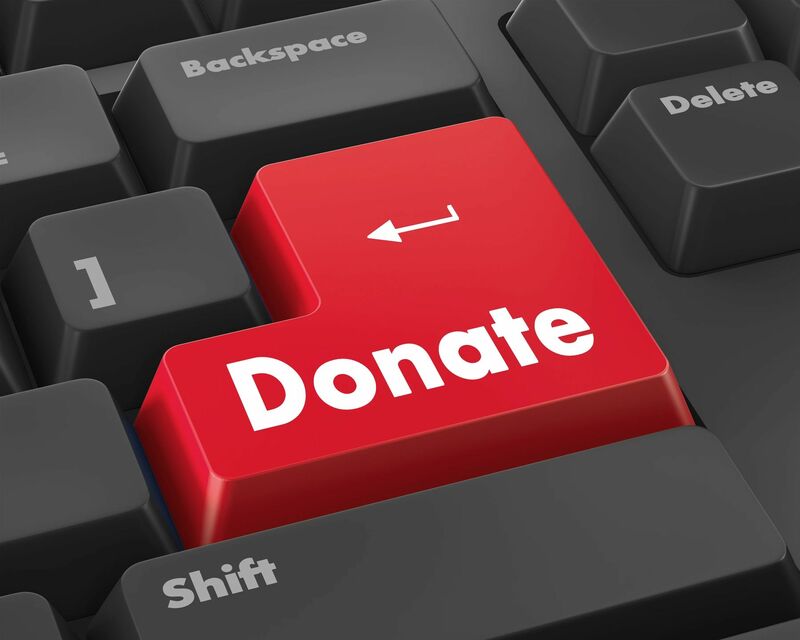 As online donation setups started coming onto the scene, the various state charity regulators realized they had to address electronic giving. NASCO, the National Association of State Charity Officials, met in Charleston, SC in 2001 and issued what became known as the Charleston Principles. The purpose was to help states develop a more standardized approach to regulating Internet-based fundraising and solicitation. These principles are nonbinding, but they serve as a guide for the way most states interpret such solicitation. An entity should always register in their own state, period. It doesn’t really matter if the solicitation is considered active or passive, or conducted by a third party. If you are a California charity, register in California. For the record, an entity is domiciled within a particular state if its principal place of business is in that state. c. (1) The entity solicits contributions through a site that is not interactive, but either specifically invites further offline activity to complete a contribution or establishes other contacts with that state, such as sending e-mail messages or other communications that promote the website. Let’s say Georgia Charity, Inc., a Georgia-incorporated 501(c)(3) public charity, has an online donation page on its website. There are no geographical restrictions on its website visibility, so anyone in the world can access it. So far, no one has interacted with their website yet, and Georgia Charity has not conducted any other fundraising activity. What should they do now? At a minimum, Georgia Charity needs to register in the state of Georgia. Remember: Always register in your own state. A few weeks later, they receive their first online donation from a state outside of Georgia. Does this transaction automatically mean they need to register in that state? Not necessarily. First of all, if the state is one of the 10 that do not have a formal registration process, then naturally the answer is, no. If it is a state with a registration process, and assuming there hasn’t been any other activity in that state, the Charleston Principles indicate that registration shouldn’t be necessary. But even so, keep in mind that the Charleston Principles are merely guidelines for the states to follow. There are a few states that would require registration in this situation, even in the absence of other activity. Now let’s say Georgia Charity sends a thank you letter to the online donor (a best-practice idea, by the way!). Also, in that letter, they include a request that the donor consider additional gifts in the future. That is a textbook, direct solicitation that should trigger a need for Georgia Charity to register in that other state…preferably before the letter is sent. As technology rapidly changes, the states are running to keep up with the electronic donation frontier. The Charleston Principles were first published way back in 2001 and, in many ways, are woefully obsolete. Back then, few people even had broadband, and no one could have ever imagined smartphones and Star Trek-style instant knowledge carried around in our pockets. Google was a three-year-old company at the time! Needless to say, changes are coming. NASCO has this as a topic of discussion at its annual conference every year. It is quite possible that in the future, any online solicitation activity may result in the need to register in every registration state. With that in mind, NASCO is currently working on an online, multi-state registration project that would make easier to comply in all jurisdictions. Realistically, this is years away from launch, but progress is being made, however slowly. At a minimum, it is critical to know what is required of your nonprofit. We’re here to help, and we can register and/or renew your nonprofit’s registration wherever required. Don’t chance the embarrassment and expense of getting penalized for noncompliance. Learn what your nonprofit needs to do and act accordingly. previous post: Is All Fundraising Considered Charitable Solicitation?